“Citizen Josh” is filled with laughs. Kornbluth is thinner now and, if possible, funnier than ever. His riff on the democratic process takes us from the last election, to Ohlone Park playground in Berkeley, with a few stops at the desegregation of an Alabama high school and his radical childhood in New York. The whole thing actually is his senior thesis, delivered 25 years after the due date. 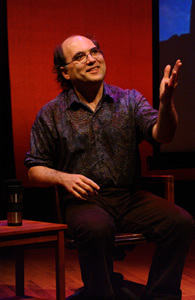 Kornbluth went to Princeton and, after realizing he was never going to realize his dream of being a great physicist, switched to political science. Under the guidance of an inspirational professor, Sheldon Wolin, and the tolerance of a kindly dean, he managed to make it through – everything but the thesis. There is another riff on killing time, which seems to have been his greatest talent in youth. He killed so much time he missed the deadline, got to march down the aisle with his class anyway and went home with an empty diploma case. All these years later, a successful entertainer and a happy husband and father, his disappointment in the Bush-Gore election leads him to track down his old professor. (His cell phone problems are another funny bit). Finding Wolin, still alive and more than willing to be his thesis advisor, he gets permission to fulfill his academic requirement (evidently there is no statute of limitations at Princeton) a quarter-century after the fact. A quick call to the kindly dean, who is still there, clinches the deal. And all this is true. What results is vintage Kornbluth: insightful, funny and, at times, moving. He tells a story of his infant step-brother’s struggle for life in an incubator that will move anybody who is a parent to near-tears. Or even anybody who is not. He comes from a quixotic line and it turns out that is just what is needed to get things done. His father, sick of watching his premature baby’s chances deteriorate, disobeys hospital rules and takes a week off to hold the child because he feels the child needs to be held. Miraculously, it works. In a way, this monologue is Kornbluth’s own attempt to tilt at windmills. Deftly directed by David Dower, with excellent incidental music by Marco D’Ambrosio and clever, graphic screen projections by production designer Alexander V. Nichols, this show is a winner. If it is not rewarded – at long last – with a degree from Princeton, this reviewer will be happy to eat her computer.